This force analyzes how much power and control a company’s supplier (also known as the market of inputs) has over the potential to raise its prices or to reduce the quality of purchased goods or services, which in turn would lower an industry’s profitability potential. The concentration of suppliers and the availability of substitute suppliers are important factors in determining supplier power. The fewer there are, the more power they have. Businesses are in a better position when there are a multitude of suppliers. Sources of supplier power also include the switching costs of companies in the industry, the presence of available substitutes, the strenght of their distribution channels and the uniqueness or level of differentiation in the product or service the supplier is delivering. The bargaining power of suppliers in the airline industry can be considered very high. When looking at the major inputs that airline companies need, we see that they are especially dependent on fuel and aircrafts. These inputs however are very much affected by the external environment over which the airline companies themselves have little control. The price of aviation fuel is subject to the fluctuations in the global market for oil, which can change wildly because of geopolitical and other factors. In terms of aircrafts for example, only two major suppliers exist: Boeing and Airbus. Boeing and Airbus therefore have substiantial bargaining power on the prices they charge. The existence of products outside of the realm of the common product boundaries increases the propensity of customers to switch to alternatives. In order to discover these alternatives one should look beyond similar products that are branded differently by competitors. Instead, every product that serves a similar need for customers should be taken into account. Energy drink like Redbull for instance is usually not considered a competitor of coffee brands such as Nespresso or Starbucks. However, since both coffee and energy drink fulfill a similar need (i.e. staying awake/getting energy), customers might be willing to switch from one to another if they feel that prices increase too much in either coffee or energy drinks. This will ultimately affect an industy’s profitability and should therefore also be taken into account when evaluating the industry’s attractiveness. When looking at the airline industry in the United States, we see that the industry is extremely competitive because of a number of reasons which include the entry of low cost carriers, the tight regulation of the industry wherein safety become paramount leading to high fixed costs and high barriers to exit, and the fact that the industry is very stagnant in terms of growth at the moment. 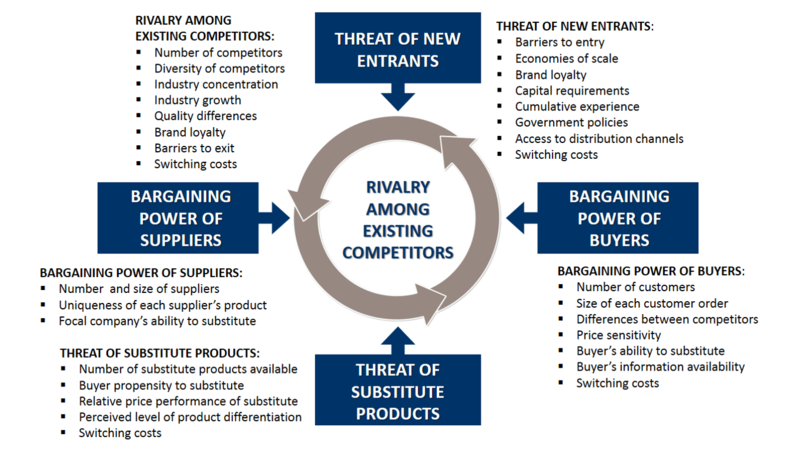 The switching costs for customers are also very low and many players in the industry are similar in size (see graph below) leading to extra fierce competition between those firms. 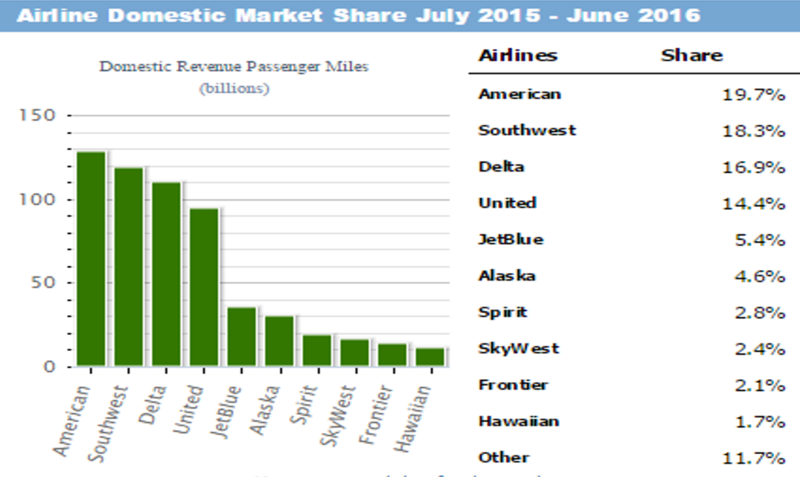 Taken altogether, it can be said that rivalry among existing competitors in the airline industy is high.